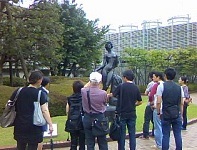 We held a study meeting of sculpture. We invited Mr. Ikki Miyake (Carver). We tried to make a sculpure. We visited The Hakone Open Air Museum (Hakone-Chokoku-no-Mori).